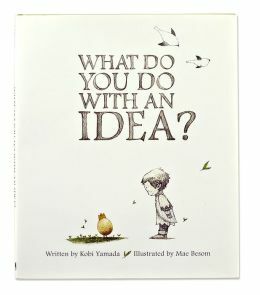 Kobi Yamada’s story follow a little kid who gets an idea. His first reaction is curiosity, “Where did it come from? Why is it here?” What follows is an exploration of the emotional landscape any kid or adult might travel as an idea grows within. Yamada explores the “strange and fragile” nature of an idea and the vulnerability a person of any age might feel when contemplating owning something truly original. As the story progresses, the child character moves from a place of reticence to an embrace of the ability to “change the world” with an idea. The illustrations move from winsome and subdued charcoal or pencil and slowly grow to winsome and celebratory full watercolor. The illustrations are engaging but never overwhelming. Motifs: Idea, Egg, Crown, Child. This entry was posted in General, Picture Book. Bookmark the permalink.